Thursday 28th June was the 2nd work day in 2012 that the DPA volunteers worked on Plymouth Leat, otherwise known as Drake’s Leat, across Roborough Common. The task was to cut bracken both in the leat and on its banks, out to a distance of about two metres. The aim was to cut from the main car park at Clearbrook, right beside the leat, along to “Dead Man’s Bridge”, a distance of almost a mile. The bridge is on Roborough Down Lane, where we finished on the last Saturday, at SX 542 646. It is so-named now because of the body that was found dismembered and burned under it in 2001. BBC News links to the event: Link 1, Link 2, Link 3, Link 4, Link 5. Once again, I must thank the volunteers who came out on this initially grey and misty day: Bill, Chris, Clifton, Derek, Elaine & John, John & Rachel, Mally, Nigel, Stephanie, Sylvia and Val, who with myself made 14 volunteers. 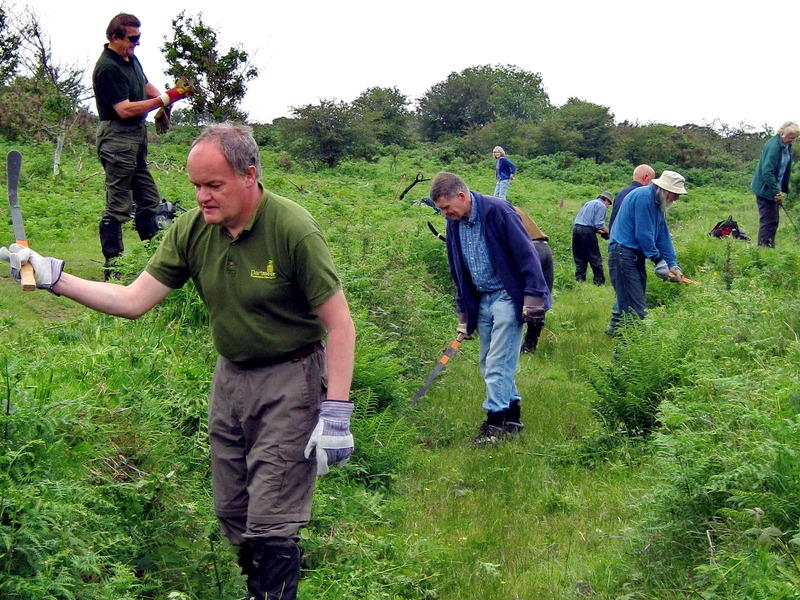 DPA volunteers cutting bracken in Drake’s Plymouth Leat with our Hen Harrier sentry on duty. Photo by Rachel. Click the image to see a larger version. Somewhere along this section before lunch there came the excited cry of “Hen harrier”! It turned out to be the white variety of hen harrier, the type that ‘pinches’ pasties and ice creams in St. Ives ….. never mind! Lunch on Plymouth Leat. Click the image to see a larger version. Someone had a special birthday today! Click the image to see a larger version. As the caption says, a special birthday. One wouldn’t want to give away a lady’s age but the Chancellor of the Exchequer has to take note and start regular payments! Congratulations! Also, many thanks for the bottles of “bubbly” stuff! Happy Birthday! Passion cake! Click the image to see a larger version. Even click it a 2nd time! 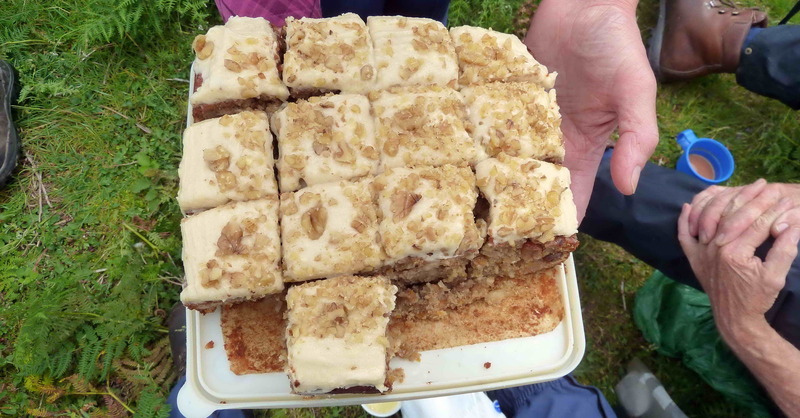 In keeping with leat tradition, there was great cake! Thank you again to Stephanie for this. Dead Man’s Bridge, with the bracken cut. Click the image to see a larger version. When we reached Dead Man’s Bridge, we had reached our target. The team had done well, again, and completed another mile of Plymouth Leat. By this time, the weather was brighter, so much so, that after we had followed another leat tradition and reached The Rock Inn at Yelverton, we were able to sit outside. There then followed our time-honoured practise of discussing various aspects of conservation work. Thank you, everyone.